We are engaged in offering BJP Flag. can be customised as per size and color, design. Offering you a complete choice of products which include Badges, Promotional Badge, Promotional Cap, Election Materials, Election Campaigning Items and Display Hoardings. We are offering an extensive series of Political Flag. These products are extremely employed in the market for diverse purposes. 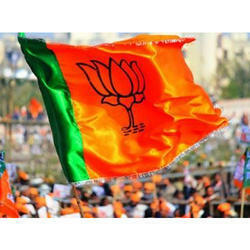 In order to keep pace with the never ending demands of customers, we are involved into offering wide range of BJP Flag.